This is my entry for LJ Idol Friends & Rivals ( therealljidol). We got to chose from a variety of topics. I went with "Let's go to the Mall." Don't throw out that blackened banana peel. While a freezer-burned remnant of its former self, that relic played a role in the story of how I met your father. When our calendar year rolled over to round numbers, the rest of the world celebrated like it was 1999. But my friends are geeks, and according to them, the proper time to celebrate the new millennium arrived when the calendar flipped to 2001. So I found myself, decked out in a gold sequined top and gold bellbottoms, at a hotel in the Philadelphia suburbs. Your father attended, along with old friends from the Penn State Monty Python Society. We all nibbled on a buffet of selected cheeses and appetizers, with a full meal served later on, as well as a cash bar. One of our friends served as our DJ, exchanging his red suspenders for a white suit with a black shirt. Truly, we were all stepping out. I love to dance, so I spent the night on the dance floor, hitting it off with a glasses-wearing computer expert, one of the few guys getting his groove on. We left the party shortly after midnight, spending some awkward but nevertheless wonderful moments in a stairwell, stepping away from each other every time we heard a door open. "The new millennium is looking up," I thought, dreaming of dazzling lights and music. My new boyfriend talked me into joining the staff for Otakon, one of the biggest Japanese anime and Asian culture conventions in North America. Good friends had founded the convention, but I'd never considered myself enough of an anime fan to get involved. Still, I welcomed the opportunity to spend more time with both my beau and my college buddies. That first year, I helped run Artist Alley, where independent artists could pay a small fee to exhibit and sell their art, usually anime- or Asian-inspired. Afterward, my boyfriend and I helped unload con equipment into a storage unit, falling asleep in my truck on each other while waiting for the others to arrive. High emotions accompanied the load-out, causing one couple to shout at each other over everyone else's bewildered heads. One fellow staffer leaned in close to me and said, "Mommy and Daddy are fighting." I stifled a laugh. As my boyfriend, always the clown, tried to cut the tension by cracking loud jokes, I fell into step with a soft-spoken guy whose salt-and-pepper hair was pulled into a ponytail. We chatted easily, lifting box after box together, walking in step despite our big height difference. A sense of calm eventually overtook the group, and jokes replaced arguing. Knowing that we had missed out on the pizza provided to staff members at the traditional Dead Dog Party, we ate out at a Chinese restaurant together, posing for a picture at the table, all leaning into each other, having bonded over our thankless work. At the wrap-up meeting for that year's Otakon, my boyfriend arrived wearing a weight vest under his jacket. We'd been having problems for months, our relationship stretched to breaking over long distance and trust issues brought about by his flirting and inability to say "I love you." The dagger had dug in deeper when a female friend, a wavy-haired woman with the world's brightest smile, told him casually, when he brought pizza once, "I love you!" He flippantly said it back to her. So when he gave me his good-bye speech, and I hugged nothing but hard metal, it came as little surprise. I would later dub him The Invisible Man in my blog, after the Harlan Ellison novel. The guy I chose to drive with me in my truck on the way to a group dinner that night? The soft-spoken guy with the ponytail, because his eyes were sincere, and I knew he would not judge me. Fate smiled in the most interesting way, pairing me up with the wavy-haired smiling woman, as roommates at Otakon 2003. Having had some time to heal, I bonded with her, seeing her as a sunny spirit who had nothing but joy to share. So when I was on my break as a Registration staffer, I popped into Con Ops to talk to her. Sitting next to her? The guy with the ponytail. Around her, he was more relaxed than I'd ever seen him. I was greatly amused that he even allowed her to French braid his hair. Before long, I was dropping in just to talk to him. His large hazel eyes radiated kindness. After hours, we all hung out in the hotel lobby, my roomie, the ponytailed guy and me. He told us about his time as a chemist, and how his job was to test birth control pills, waggling his eyebrows naughtily. Then he told a long story about how he'd once served as a handler for a popular female voice actor. She was the sort of celebrity who was humble and had a good sense of humor, so when he brought her lunch to her at the autograph table, he wordlessly handed her the banana to sign. 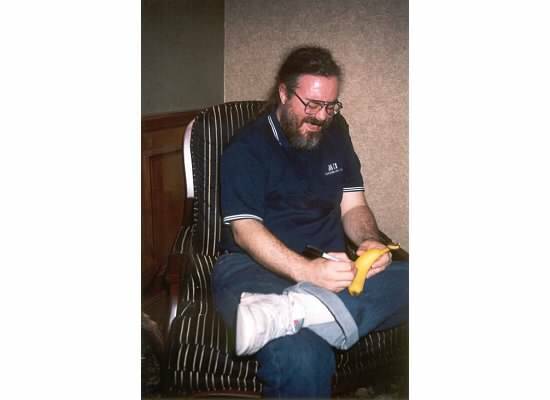 My roomie and I picked on him, joking that he must have secretly liked her, since he asked her to sign his banana. When the weekend ended, I happened to have one piece of fresh fruit left from my stash: a banana. I carried it downstairs, crossed the lobby, and asked the sweet-eyed, kind-voiced guy with the ponytail to sign it for me. The Gryphon signs the banana. When I looked up the phrase "Let's Go to the Mall," I discovered it was a song recorded by one of the characters on the sit-com "How I Met Your Mother," which is what inspired this piece. Thank you! It was a bit of a tricky subject. I didn't have a lot of stories regarding malls. I thought about writing about the annual Mall Climb we used to do with the Monty Python Society back in the day (where we would "turn gravity 90 degrees" and climb like mountaineers up the Campus Mall), but I couldn't find an angle. Plus, it would have been too many characters! I'm glad you picked up on the bittersweet part of this. That's what makes this story so special to me, the fact that something infinitely good came out of something that, at the time, felt earth-shakingly bad. Really enjoyed this easy-going entry about meeting love. Thanks! That story of how I met my husband is always such fun to tell. Wow. This was absolutely wonderful. Very cute story! I can't believe you've been staffing Otakon so long! The only year I got to go was 2013 when I was living in Maryland. Bummer I couldn't find you D:. Yes, I've been there a literal dog's age. In fact, I'm still the head of Press Relations and hoping I can balance that with settling my mom's estate. This is a great story! I'm glad that it worked out so well. I liked how being with one person led to being with someone else, which is the truth, but you tease us with it. Actually, the sequenced nature of the story was very cool and built good tension. I like this. Thanks! It turned out that our real story matched the format of "How I Met Your Mother" very well, with one relationship leading to another, and the results of actions sometimes being unpredictable but everything being connected. This is very sweet, and I like the idea that that silly TV show can maybe inspire people to write down their meeting-stories for their kids. I like the picture at the end, too, it just made me chuckle a little and added a nice touch. Aww, that is sweet of him. What a wonderful story! And almost two years from the time you glimpsed each other to when you began a new sort of relationship. I truly am blessed. Thanks for the thoughts! Very sweet introduction story. Thanks for sharing. Thank you! I'm truly blessed with my husband.